Amerikan Steels Pvt. 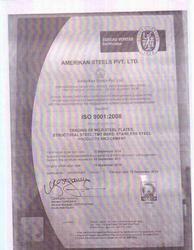 Ltd. is An ISO 9001:2008 certified wholesale trader, distributor, exporter and importer house of Ferrous & Non Ferrous metals in the field since 38 years with an annual sales of around 48000 MT with proven track record & undisputed leadership satisfying steel requirements of 241 corporate sectors & business houses all over India. 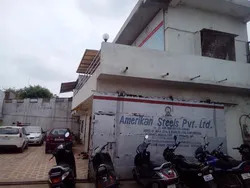 The company is associated with India's leading steel producers like SAIL/ESSAR/VIZAG/TATA/JSW/JSPL/JINDAL/Arcelor Mittal/Uttam and leading rolling mills in India to satisfy needs of all leading corporate clients with respect to MS / SS Plates , Structural Steel, TMT Bars, Boiler Quality Plates, Rails etc. 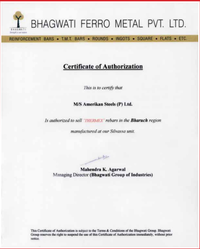 ASPL is also associated with secondary TMT bars producers like Bhagwati , Kothi, Rudra, Electrotherm, Gallant, & various others all over India. ASPL has enough capacity and resources to meet any steel requirements with desired quality, size, and grade at a very short notice. Our clientele includes many MNC's and Blue chip companies like Reliance industries Ltd., Larsen & Toubro Ltd., Aditya Birla group companies. Present directors Mr. Chandraprakash Doshi & Mr. Rakesh Doshi from the third generation in the family to be in this business putting their efforts by continually improving performance standards. 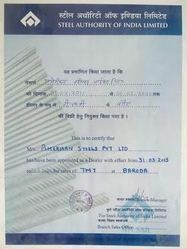 Our distributor certificate from TMT. Our distributor certificate from Thermex. We have picked the trustworthy vendors of the market with excellent market record. Our procurement agents have in-depth knowledge regarding various market trends, and clients' demands. We have been able to gain maximum clients' satisfaction by offering the best quality range of products. Our procuring agents choose our vendors after complete verification regarding product quality, production base, production techniques, etc. We have huge business links with our authorized vendors and we encourage them for consistent improvements and changes for the best results. Made in India Global Company most known for offering only Quality products clubbed with marvelous piece of service and contribute to India’s growth with a very Good Share. Amerikan Steels will be as famous as any brand in the country. The share price of the company will be in 4 digits and will be in line with the best in the country. The group laid its foundation in 1977 under the leadership of Mr. Pokhraj Doshi, personality with vision, passion and with an ability to make things happen. Dynamic and growth oriented, he aimed to develop the group as one of the leading & most preferred trading house around the country and has made it happen. manufactures and sells a broad range of steel products, including hot and cold rolled sheets and coils, galvanised sheets, electrical sheets, structurals, railway products, plates, bars and rods, stainless steel and other alloy steels. 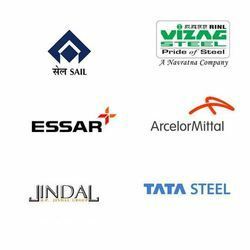 SAIL produces iron and steel at five integrated plants and three special steel plants, located principally in the eastern and central regions of India. Steel’s product portfolio includes Hot Rolled, Cold Rolled, Galvanised, Colour Coated steel, and Pipes and Plates. It has a completely integrated distribution business consisting of nine steel processing and distribution centres with an aggregate capacity of over 5 million tonnes and 375 retail outlets under the brand Essar Hypermart. (JSPL) is one of India’s major steel producers with a significant presence in sectors like Mining, Power Generation and Infrastructure. From the widest flat products to a whole range of long products, JSPL today sports a product portfolio that caters to varied needs in the steel market. The company also has the distinction of producing the world’s longest 121 metre rails and introducing large size parallel flange beams in India. Visakhapatnam Steel Plant,popularly known as Vizag Steel. 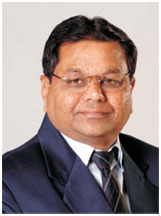 A new company Rashtriya Ispat Nigam Limited (RINL) was formed on 18 February 1982. Visakhapatnam Steel Plant was separated from SAIL and RINL was made the corporate entity of Visakhapatnam Steel Plant in April 1982. Arcelor Mittal isleader in all major global steel markets, including automotive, construction, household appliances and packaging, with leading research and development and technology, as well as sizeable captive supplies of raw materials and outstanding distribution networks with an annual production capacity of around 130 million tonnes. A top ten global steel maker and the world’s second most geographically diversified steel producer with an annual crude steel capacity of over 28 million tonnes per annum (mtpa). We have experienced procurement agents, who help us to offer the finest quality range of products to our clients. Our offered products are highly demanded for their durability, corrosion resistance, impeccable finish, high strength, etc. Following are the facts which set us apart from other organizations. ASPL is one of the few business houses in Gujarat to be dealing in all the steel products with a core competence including MS Sheets, Plates, Structural steel, TMT Bars, SS Sheets & Plates, etc. We also supply entire steel products & Cement to SEZ's / EOU's without payment of Excise duty under cover of ARE 1 ,ARE 3 and PAC. ASPL has been working with leading third party inspection agencies like BVQI, DNV, TPL, LLOYDS, IRS, AKER KVAERNER, SGS,QSS, IDEA etc. 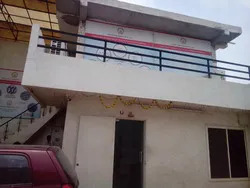 Having sources and firm tie ups at various steel centers all over India like Ahmedabad, Kutch, Bhavnagar, Silvassa, Punjab, Ghaziabad, Mumbai, Nagpur, Raipur, Bhilai, Rourkela, Raigarh, Kolkata etc. We have a team of professionals at various level of operations along with a product head for each product to take care of your steel related challenges. We export our products All around the world.